Reagrupament has celebrated this weekend, two years after its creation, the 4th Assembly of the formation. A good moment to value the work made until now and the electoral results, which left them out of the Parliament of Catalonia and of the City Council of Barcelona in the last elections. 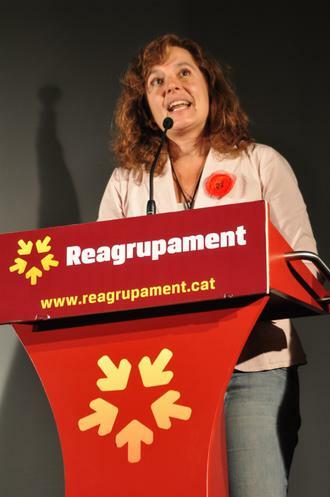 The Reagrupament’s vice-president, Rut Carandell, warns that the project of the formation is clear at this moment: to work for the unit of the independence. One of the backbones of the 4th Assembly was to debate the political paper approved in May of 2009. Have there been any changes? We have supported the same paper, basically, but we have taken into account several events that happened in this past year and a half that we must bear in mind, such as the ending of the local opinion polls, the sentence of the Estatut and its rejection, the decision of The Hague Court about the independence of Kosovo, the “indignados” (indignant protesters) movement — which reinforces our democratic regeneration demands. But these facts…do they modify the way of working or the next steps of Reagrupament to be undertaken? No, they don’t. There hasn’t been any amendment that redefined the way of working that we have been using until now. Nobody has criticized that we are an association of political action. It has also been maintained the will to take part in the elections, either through coalitions or through giving support to a candidacy as broad as possible. The line is to maintain the same status regarding our political work. The Assembly has approved improvements in the regulation of the organization. It has been decided to reduce the number of members of the board, but why? No, it isn’t. We keep being an association that wants to do politics. We don’t like political parties. We work for projects and we have a lot of impact on the territorial assemblies. We will also promote trade associations in order to check the routes and the corpus that we want to present to the elections. There are still the same purposes. There has been a regeneration of people, but there are people more known than others. We have incorporated to the board a person for every veguería (future substitutes of the current catalan provinces), therefore, there are nine new people. But yes, there are eighteen people that aren’t new, because we already were a work team before. Throughout these two years, what mistakes have you made? We have to improve the organizational aspect. We have also checked the numbers and have congratulated ourselves because of the balances of the accounts. We keep being autonomous and we do not owe anything to the banks. We have also stated that it’s very difficult to break the parties system and try to get the offers to the people. Therefore, we have to fit the speech to messages that the people understand. The fact that, unlike other independence parties, yours must act from outside the Parliament, has it made you consider something? We have stated that there were no other offers like ours in terms of regeneration. We maintain the will to look for cross-dimensional topics about independence. And we undertake to seek the unity among those parties that want to give a step forward to the independence, from ERC to Convergència, since none of those parties will do anything on their own. We want to lay the foundations to get all this off the ground. What is your evaluation of the electoral results? We have obtained around fifty councilors. We have people from CUP, for example, in Girona; people who has field with CiU, like in Olot or Vilanova; with Solidaritat, in Tàrrega, or also with ERC. This proves that the cross-dimensional aspect that we want, and that in these elections we have put it into practice spontaneously, is possible. And it is in this aspect that we have to work on. We believe that the work that we have done is good because we have allowed the independence movement to reach the City Hall.Carretero said that ERC had to be “the backbone” of the independence. Are you depending on the congress of the republicans? We are, but the decision is going to be taken by the ERC militants. I have the feeling, nevertheless, that inside ERC there are different souls and some of them, that have options to get elected, are not pro-independence. We would like for the ERC’s congress to have a strengthened way, to only think about the independence and so we could work together, whereas as an electoral coalitions or only as a support. ERC must have a role in the end of this dispersion. In this sense, are you sorry that Portabella has decided not to stand for? The most important thing is not the people but the ideas that triumph in the congress. We will not talk about the people of other organizations. But if we coincide while working it will be much easier.There was a talking of making a coalition of independence parties to face the elections of the Congress of the Deputies. Would you be ready to take part in it? Is there something concrete? Any offer in that sense is of our interest we are ready to work in favor of the unity of the independence parties, just like the assembly has approved. We will bet on the unity a hundred percent.Therefore, you do not reject to stand for the general election. We do not exclude any kind of elections.If there is no unity, you will go for it also on your own. The concrete decision of standing for to a Spanish election would have to be debated in another assembly. If Zapatero brings forward the elections in autumn there is not a lot of time to decide. Yes, but if it is necessary, it is not difficult to summon an assembly. First we should know if more forces will go or if we should go alone and which would be the program of these forces … it does not only depends on us. We, nevertheless, do not reject any idea. After a year of the judgment against the Estatut and once that the waves of the local opinion polls have ended, how do you see the independence movement? Encouraged or deflated? It is very alive. The independence movement has not got blurred but many other elements have been added. If before there were arguments of national right and of democratic responsibility and dignity, now there are elements that have been added such as ways to go out of this crisis. Therefore, it has been reinforced the conviction of the people that it is necessary to change the things, not only as nation, but also as citizens. And it will take another level, because if before the contributions to the Spanish stock exchange were understood to a philosophical and sentimental level now it affects us more because our pockets are involved. But the incorporation of the self-determination in the manifest of the “indignados” of Plaça Catalonia raised a lot of polemic. We think that the movement of the “indignados”, in its conception, is deeply Spanish. 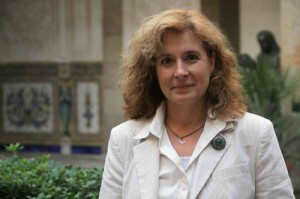 The measures of political regeneration, such as the unique circumscription of the state, and all the actions that are designed, are always thought with Madrid as a center. And is there some reason for that? May be they have done it with the will to take away the importance of what has been called “the infuriated Catalan”. I insist, we all share and agree that now we all are very infuriated, but this movement does not think about Catalonia like a priority. That is to say, those that attacked the Parliament of Catalonia had a deep Spanish vision.